they save time and gas money on our journeys. We love them. Most of us know all the ones around our area. Then there are the short cuts on computers. Recognize any in the picture? I love them … they save time AND brain cells. Got any boxed mixes in the cabinet? Oh yeah, love those too … save time, energy and it is a fast road to something good to eat. Our short cut mentality takes over in every area of our lives. Once we start incorporating it in one area, it slips over into another, then another. But, we get the job done. Or, do we? You see people taking “short cuts” in their work, raising their kids and even in their spiritual lives. They use quick fixes … putting off the inevitable. 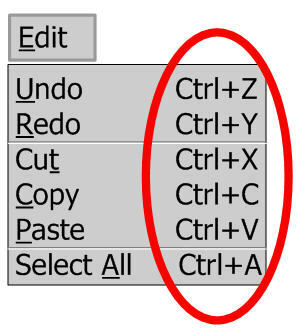 Unfortunately, like our little computer menu, they need an “UNDO” because eventually short cuts catch up with you. Remember the movie “SANTA CLAUS” where the elf, Patches, designs a machine to shortcut production? That turned out well., right? How about at your job, or as a mom … a dad, an employee, or a church volunteer; taking any short cuts and “getting ‘er done”? Sometimes it is not about finishing, in fact most of life is not just finishing, it is how you got to the finish; the journey. Many are wiping their brows, “whew, got them graduated”. A diploma from high school, college, etc. is nice. You “got ‘er done”. Now comes the hard part, where you sit back and see if all the short cuts you took raising them are going to back fire. Are there “holes” in their so-called education? Oh, they can read and write, but where are they on a spiritual level? Where are they in character? What values do they have, if any? Did you just raise them the way you were raised, or maybe you insisted on raising them “better than your parents raised you”. Look at your work ethics. Will they work like you? Is that a good thing? How about your spiritual life; will they walk like you? Is that a good thing? Have you passed on a “short cut” mentality to the next generation? Is saving time a good thing? What did you really save? The good news is, in the Christian life there is an “UNDO” button = Control + Christ. Did any of those “too quick to click” maneuvers backfire in an area of your life and you do not know how to fix the mess you have made? Put it in His hands. It is never too late to turn it over to Him. He has been waiting for you to relinquish control. At work, at home, raising kids, volunteering at church … put the control in Christ’s hands. Short cuts in your work life, your home life, children’s lives or church life will bring forth poor results. Take time to seek Him, read His word and talk with Him … often. Then, as we all will need to do, use the UNDO daily. (Disclaimer: NO, this was not inspired by any of my friends who happen to have high school and college graduations right now :-D). This entry was posted in COPYRIGHT:, Mom2Mom and tagged Bible, Christian parenting, graduation, Prayer, short cuts, work ethics. Bookmark the permalink. ← It ain’t over ’til ….